The time has come to show off the final look of my Closet/ Office! Our once boring, old, game closet has been transformed into a beautiful functioning office space. If you would like to catch up on what has happened up to this point, take a peek here and here. The final process has involved some bruises, sweat, and tears, but it was all worth it. 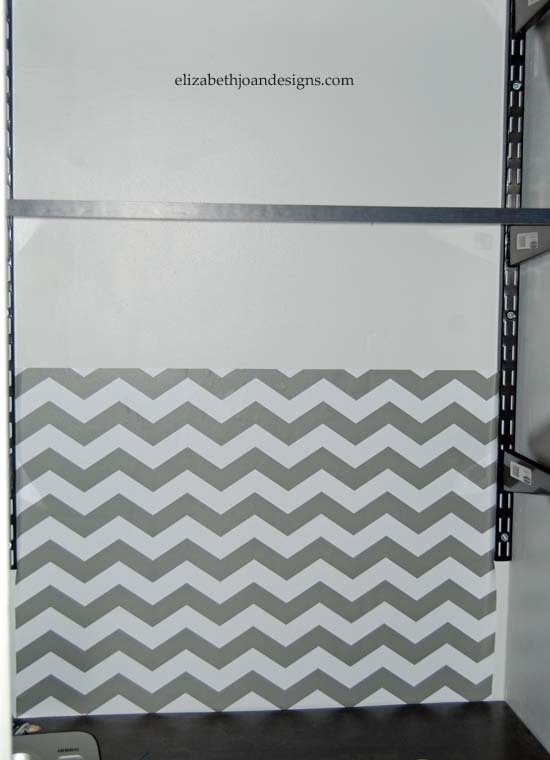 To make this tiny space a little more interesting, I decided to apply some fun chevron contact paper to the wall behind the shelves. This sounded easy enough, but proved to be the hardest part. Because the space I was working in was so small, I couldn’t fit my step stool all the way though the doorway. So to reach the highest points with the paper, I had to really lean against the step stool safety bar. This is where the bruising came in. Right across my shins. Ouch! At that point, I decided to ask for help from my super tall husband. (He is not freakishly tall, just 6’2″. He helped for quite awhile and was a trooper about it. In the end, he just showed me I wasn’t crazy for thinking this was difficult. After he surrendered, I was feeling a bit refreshed from the brake I just had. I persevered and finally finished it up, and replaced the shelves back in the closet. The happy tears started to flow uncontrollably from my oh-so-tired eyes. Yay! Mission completed! In this closet/office there are a couple details I am excited to share with you. 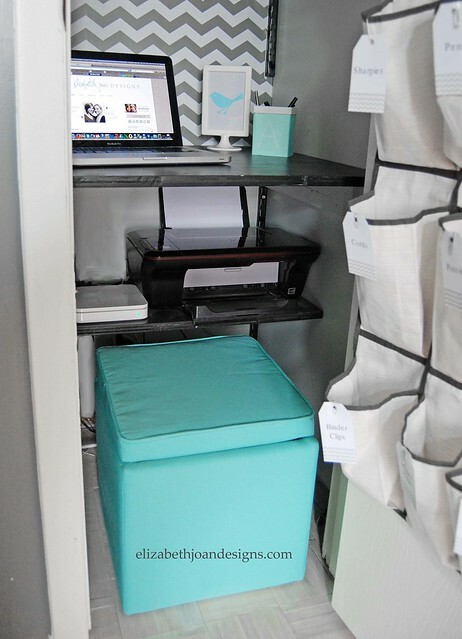 I chose this storage ottoman for the desk because it was modest, functional, and could squeeze into the itty bitty spot under the shelves. This gem was found on clearance at Target for $8.00. My husband pulled out our handy dandy drill to create a perfect hole to put cords through. This has made the desk area a very nice charging station. Underneath the desk, I placed a smaller shelf that houses our printer. It has been so convenient to have everything together in a closet, out of the boys’ reach. The cost of this project was pretty minimal. 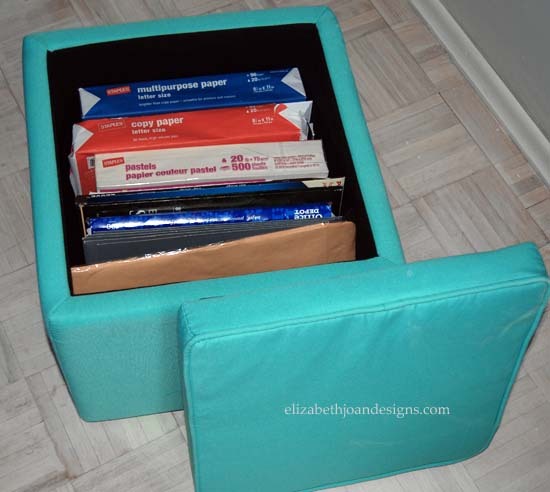 I reused so may things we already had.The contact paper, the over the door organizer and cube seat, were pretty much the only things I purchased, bringing the grand total to around $35. Woohoo! So, what do you think? I love it, other than the contact paper issues, it was pretty easy to do. Has anyone else updated a closet recently? 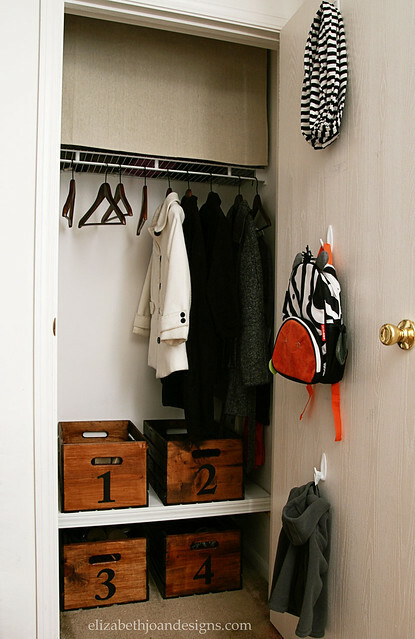 Your closet/office looks amazing! Love it! Thank you for stopping by Ritchil! I just discovered your website and I LOVE (just added to my reading list). 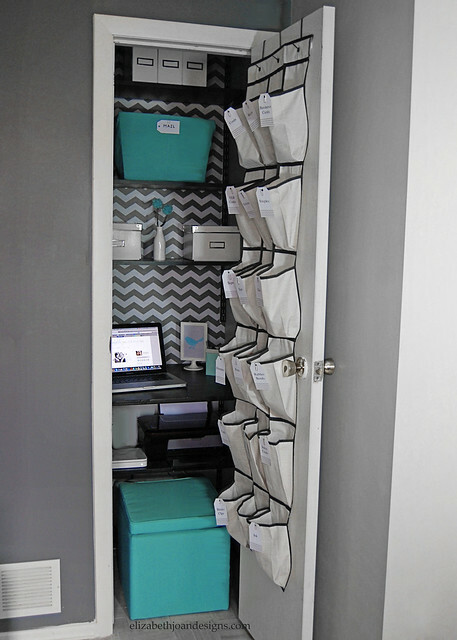 I love this closet to a office redo. I was wondering though, do you feel cramped sitting there with the organizer so close and the door not able to open all the way> My first thought was to take that door off, but you are using it for so much storage. Maybe put it on so that it opens the other way – a bit more work, and you have already done so much already! – and it would block a vent while you have it open, but it might make it more roomy feeling… But, my goodness, what a beautiful space. I love chevrons! I have office envy. Thanks Alyssa! I do feel a little cramped sitting there. This closet is in our playroom, so the kids are pretty happy with me just being in the same room with them. With a 2 year old and a 4 year old I take whatever peaceful work time I can get. I never thought of switching the door though. What a great idea! That really would make it feel more roomy. Glad you stopped by! This is so cute! And my favorite colors! :) Love it! Thanks Nicole! I also love the colors. It definitely brightened up the space. Glad you came by! I love this office space! It’s so light and fresh! Love the color combo! 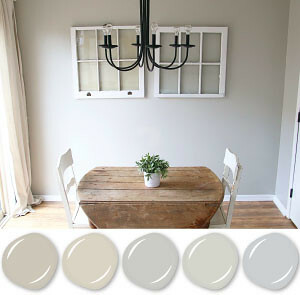 Great Ideas -- 24 Spring Home DIY Projects! Thanks Caitlin! I love that Target Vase. Great minds do think alike! Coming by now to check out your spring mantel! Glad you stopped by! Thanks Marty for stopping by! I really enjoyed trying to figure out how to fit everything in such a small space. I love the redo! I turned a small closet into an office before, but definitely not as beautiful as yours. You sure packed a lot of storage space in there. Great job. Thanks you so much Eriene! It was a fun makeover to do. Glad you stopped by! This turned out so nice!! 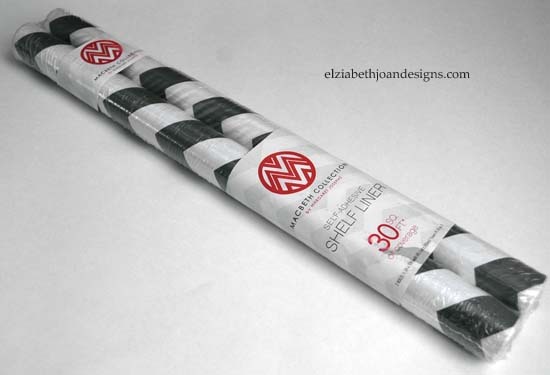 I love the idea of using gift wrap as wall paper!! Stopped by from Hit Me With Your best shot! Thank you, Selene, for stopping by. This was a really fun project! So cute! I love the gray and aqua. Thank you Kim! I am really happy with the colors. Glad you stopped by! Thank you so much Melissa! What an honor! It was a really fun project. I would LOVE to have a cute space like this to work! What a transformation! 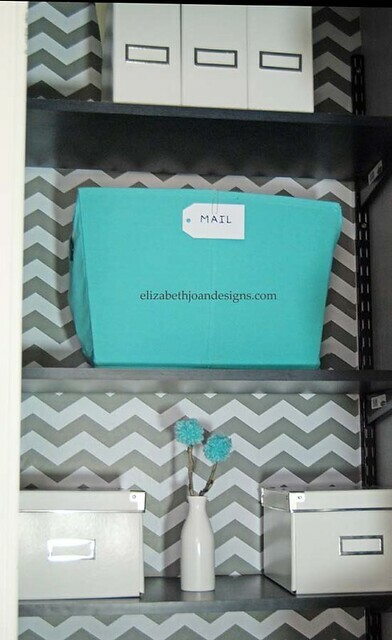 I love that chevron contact paper. I’m going to have to try that somewhere in my home. Would you mind to share this at the Frugal Crafty Home Blog Hop? 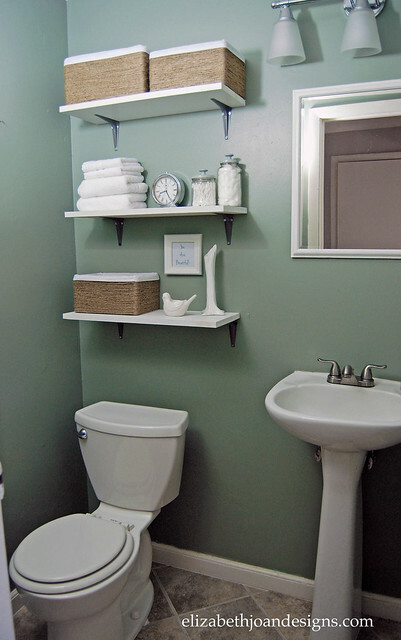 We love to see frugal renovations like this! Thanks Carrie! I am heading over to link up now! I love your office.! 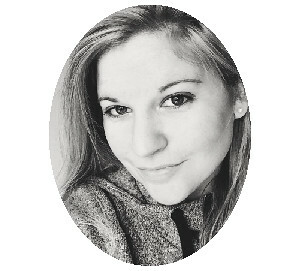 I am new to Facebook/Pinterest , etc. so not sure how ” blogging” works, but I have also redone a few closets. 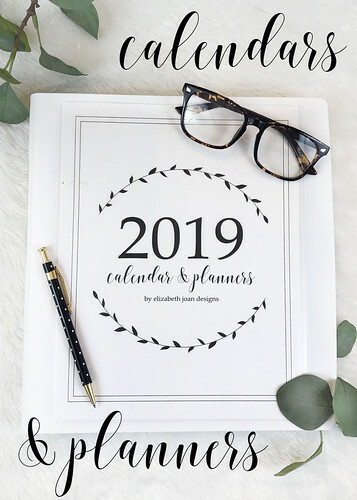 I really enjoy organizing and decorating and have been looking at the variety of websites like yours and have become addicted! Thank you so much for sharing! Thank you so much for stopping by Shari! Wow! 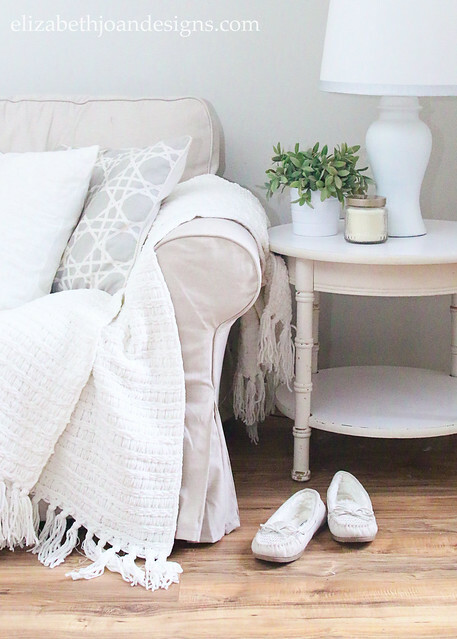 I can’t believe how efficient this small space is! Great job and love that you used patterned shelf paper. Great idea. Thanks for linking up at The Makers! Thank Corey! This is was such a fun project to do. I really enjoy having an organized space to work. Very clever use of space and it turned out beautiful! Thanks so much for linking up at Sunday Soiree! Thanks Marie! Glad you stopped by! LOVE THIS! I came across your closet/office transformation on Pinterest and had to stop by and let you know how much your project has inspired me. THANK YOU! One question: Was your closet already pre-wired for electricity or did you hire an electrician to wire the closet? From a budget standpoint, how expensive of a proposition is it (on average) to add the electrical? Thank you AJ! We had an electrician wire the closet a while ago when we were having a bunch of other electrical work done in our home. I am not exactly sure on the individual pricing for this as we paid for everything all at once. If you call a local electrician they should be able to give you a free estimate. 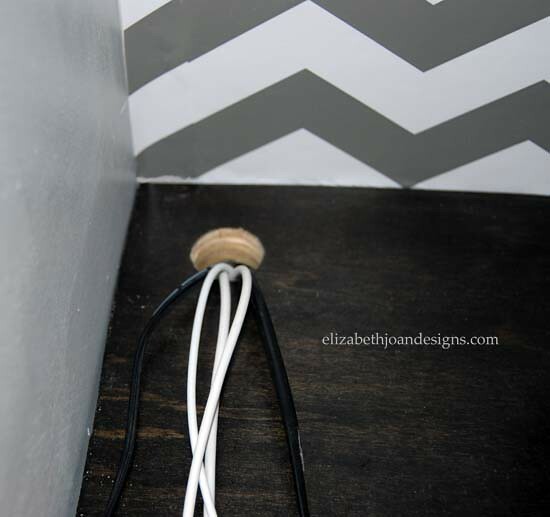 For tips about hiring an electrician you can check out this post http://elizabethjoandesigns.com/2013/10/electrial-work/. Hope this was helpful. Glad you stopped by and good luck! This is genius! I’m so glad I came across your post. My craft room/office became our daughter’s room last fall and since then I’ve been working at the dining room table. 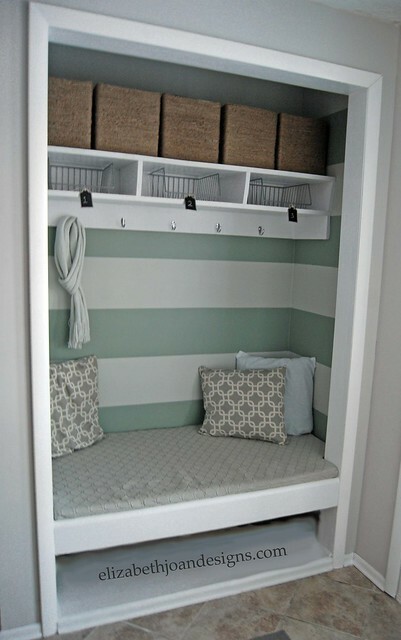 We have a closet that would be perfect for an office. Thank you so much for sharing! I absolutely love what you did the rejuvenate the space!!! I have only one question and that is, what is that bin thing on the second shelf from the top? The teal one? 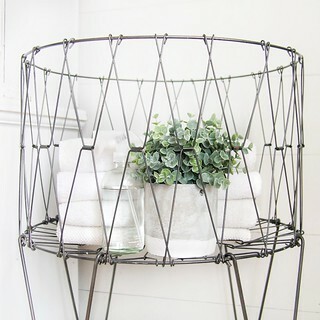 I’m upgrading my room and am looking at buying around 8 or 9 of those bins and I’m trying to find a really good place to get them besides Walmart (Target is already in the works with the project) and I don’t remember what they are called. Thanks for the inspiration!! I just had this very same thought months ago and my husband poo pooed the idea with “how are you going to get the power to it” and I gave up until I just saw your post!!! Still don’t know about power but where there’s a will there’s a way!!! This is ingenious! Could you tell me what you use the compartments of the shoe holder for. Desperately trying to get organized and have a huge problem keeping mail I’m one place in my home. (I need all of the organizational tips I can get!